Working on Trellis last night was a no-go. Too much interruption to get into that pattern. So I finished a pair of Christmas socks which I cannot show you... due to the prying eyes of Miss Snoop Bloggy Blog. I also worked on the cashmere scarf for a while until I got bored with that pattern. Since I did finish the socks, I allowed myself to start another pair... also for Christmas gift giving. These will be for daughter #1. The opal yarn feels thinner than the Lana Grossa Meilenweit I just finished up with. 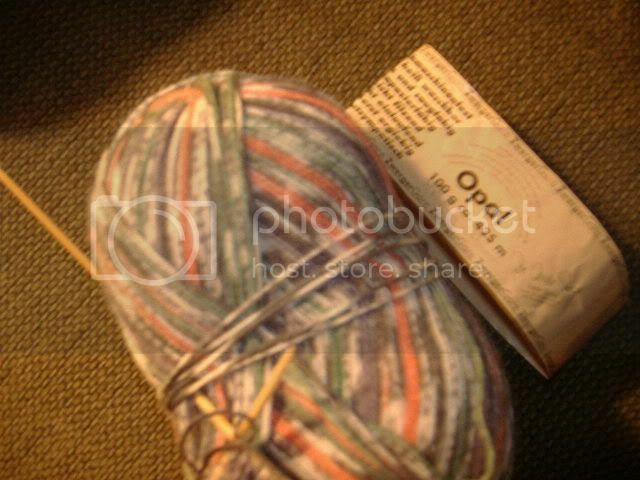 I love these opal self patterning yarns. I love sock knitting period. I have to say it's my favorite. So Cate is coming home again tonight which wasn't planned. Her boyfriend is from here as well and also goes to SRU. His best friend (also from here) lost his father this week in a firefighting training accident. He was an instructor and apparently passed out in a burning structure during a drill. No one knows why and I guess it took them a while to realize he was down. (well, obviously). Sad. Very sad... he was only 47. I have promised myself I will pay more attention to my house than to knitting this weekend. I still haven't dealt with the flower beds for winter or window cleaning that has needed done for months. Our spare room looks like a bomb went off in it. Now that things are slowing down with real estate, I need to take advantage of these slow weekends and get some things accomplished before the holidays. This knitting addiction has wrecked havoc with the condition of my house. I feel like an "yarn alcoholic" at times... ignoring important things and letting things go just so I can knit. There are times when I think I should go into therapy. Yikes!